Colin Gregor (born 31 May 1981) is retired Scottish rugby union player. 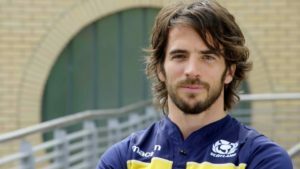 He was the captain of the Scotland 7s team from 2009 to 2014. He is only the 8th player, and first Scot, to score over 1,000 points on the IRB Sevens World Series. He is one of only 13 in all forms of rugby. His rugby career started with mini rugby at GHK and subsequently Glasgow Hawks. In the latter years of his education at Balfron High School he joined his local team, Strathendrick RFC. Colin played an integral role as the team in the 8th division of Scottish rugby went on a ‘fairytale run’ to the semi-finals of the Scottish Cup. Gregor retired as the most capped sevens player in Scottish history, playing in 58 IRB Sevens World Series tournaments, three Sevens World Cups (in Hong Kong 2005, Dubai 2009 and Moscow 2013) and two Commonwealth Games in Melbourne, 2006. And as captain at Glasgow 2014. He plays as a Scrum-half or Fly-half.